If there’s one thing I feel I could talk about a little it’s social media. There are so many wonderful things about being connected to people from all parts of your life and also with the whole world. I rely on social media for nearly everything – from breaking news, subway closures, Samuel L. Jackson’s crazy tweets, coupons, interesting articles, up-to-the-second events to simply connecting with people. And sometimes it can be quite overwhelming with all the new apps and social networks being developed constantly and things changing so fast. Here are some of my own personal tips to help you organize your social media life. Comment below if you have any good ones to add! Pick 3. Or Pick 2. I have 3 social networks I try to stick to and in this order: Instagram, Twitter and Facebook. It’s really a matter of preference what you pick, but pick a few networks and stick to them. I got rid of Foursquare, Pinterest, Tumblr, SnapChat, etc. You can’t possibly keep up with all of them. It’s fun every once in a while to go check on them, but you should focus on just 2-3. And definitely have more than just one…we all need a place outside of Facebook. Instagram – Get into it. My favorite of all social networks. I think it’s more fun to talk about life with just a photo (or now a video!) and a caption than reading someone’s long status update. Not only are the photo filters pure genius (Clarendon is my fave! ), but it lets you post quickly to Twitter and Facebook and you can choose which one (or both) you want to post to each time. 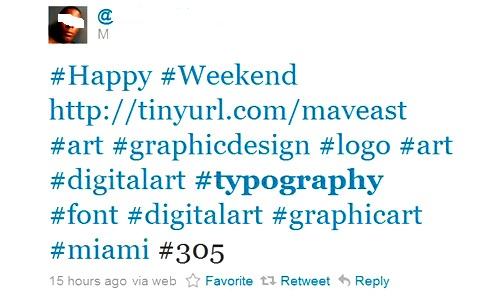 This saves a TON of time and you can pretty much tweet constantly just from Instagram. If you just want to use a filter quickly but don’t want anyone to see your photo, go ahead and post the photo and then you can delete it instantly from Instagram (and it still saves to your Camera Roll). Facebook LISTS. 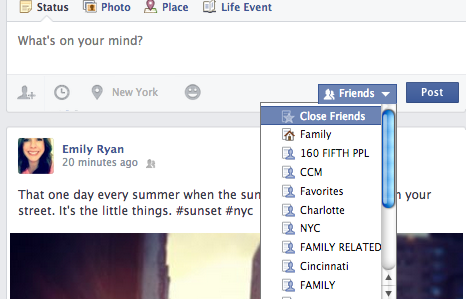 Nothing is more important than the little “Friends” and “Custom” button when you’re writing a Facebook update. I have made Lists for the following: Work People, Close Friends, Family, Family-Related (meaning they’re technically family, but not super close), Charlotte, NYC, Cincinnati, NWSA (my high school friends), CCM (my college friends), etc. It’s so important to make lists of people, because many times I want to post something and HIDE it from my Work List or I write a post about NYC and I hide it from the “Charlotte” List (who might care less about a NYC-related post). Or you can choose to show it ONLY to Charlotte people. It’s important to set these up and then utilize them. Not everyone on Facebook needs to see everything you post. Just click “Custom” and choose what you want to do. You can also hide from certain people by typing in their names. This button is super important! 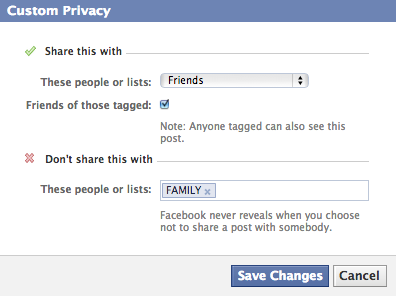 Choose “Custom” in the drop-down menu and pick who you want or don’t want to share a status with. Don’t worry “FAMILY,” I rarely hide you! 4. Make folders on your iPhone. This is hard, but try to stick to 2 pages on your iPhone. The first page should only be what you use every single day. The second page should be folders. 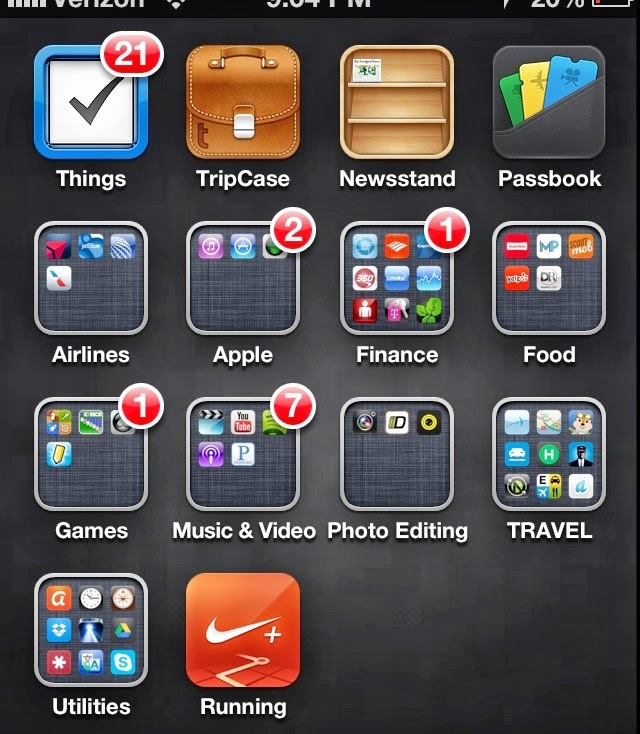 I have folders for the following: Finance, Travel, Airlines (a separate folder), Utilities (Clock, Compass, Calculator, etc. ), Photo Editing, Food, Games, Apple (for iTunes, App Store, Find iPhone, etc.) and Music/Video. Don’t be scared of folders. You will learn quickly where things are. Then, put your folders in alphabetical order. 5. Every Sunday (or whatever day you choose) sync your phone photos to your computer and then DELETE them off your phone. And then once a month, make sure you back up your computer photos to a service like Amazon Cloud Photos, iCloud, DropBox, Flickr, Google Photos or an external hard drive. 6. LastPass. This is one of my favorite computer add-ons. You download and add this little, red star button an install it in your Bookmarks Bar. It saves all your passwords and syncs it to all your devices. It’s brilliant. Read about it and download it. You will love it. No more trying to remember passwords – EVER. It also has a great “Fill Forms” features, when you’re checking out anywhere online, you click one of your pre-entered credit cards and it fills in all the details. Just make sure you have your Settings so that it logs you out when you close the browser. What’s great is that there’s a mobile app to go with it too, so you can have secure access to all of your important info/cards whenever. 7. Gmail “Under 50” Rule. I used to have 150+ emails in my Inbox at all times. One day a few months ago, I sat down and reorganized and started “archiving” everything. (The archive button is the one below on the left with the arrow.) I got my Inbox to under 30 emails (so I could see all emails on one screen) and it was the most liberating thing I ever did. I try to always keep it under 30, or under 50 on a bad week. The key is to “unsubscribe” from everything. You really don’t need emails from J. Crew, Groupon, Living Social, Gap, Ann Taylor, etc., every single day. Or if you do, make a folder for “Coupons” and put them in there immediately. Also, archiving feels as great as a “delete,” but it’s not. When archiving, Gmail keeps the email forever and when you search, it will be available in the results. So archive stuff. And use tons of folders to organize your email. Archive button in Gmail is on the left of your Spam and Trash buttons. 8. Hide, hide, hide all the crap. Facebook is getting full of annoying ads. Start hiding them now! Click the tiny arrow in the top right of the ad and then “hide” and you will never have an ad from that company show up again. Also, start hiding people that annoy you. They won’t know! I also recommend going through your entire Friends list once a year and deleting people that don’t need to be there. My rule of thumb: If I know I will absolutely never see them again and I barely know the person, “unfriend.” Sorry! 10. HootSuite OR Buffer: Finally, HootSuite and Buffer are great apps to organize and post to multiple social media networks all on one Dashboard. If you use Facebook, Twitter, LinkedIn, Pinterest, Google+, etc., you can have them all in one place and schedule your posts in an instant. It might seem confusing at first, but let me assure you that once you use it, it’s a very handy tool. Especially if you handle social media for business. These are a MUST. And Latergram.me (phone app) for scheduling Instagram posts is genius!